Joanne Hinchman-Giuffre, M.A. CCC-slp CPI, is the Director of Miracles in Communication, and has over 30 years experience practicing innovative and cutting edge speech and language pathology. Working with Child Study Teams in implementing interactive communication programs for children. Planning and Implementing Alternative Augmentative Communication (AAC) programs for individual students using a team approach. Consultation with other professionals such as teachers, occupational therapists, physical therapists and physicians is conducted throughout the therapy process to meet the needs of the child. Joanne has lectured extensively in her expertise on autistic spectrum disorders, and motor speech impairments and analysis and diagnosis of communication handicaps at local and national speech and hearing conventions, learning disabilities conventions and college conferences. 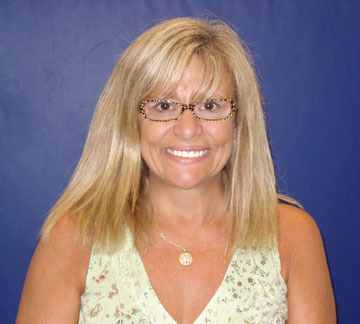 She holds her certificate of clinical competence and New Jersey license in speech and language pathology. Joanne has also been an instructor at the PROMPT Institute, a non-profit organization, dedicated to investigating and promoting holistic, dynamic, multi-sensory assessment and interventions for individuals with speech production disorders. Therapy at The Miracles in Communication is conducted with respect for children and adults. The family is an integral part of the therapeutic process and input from clients as well as family members is valued. Therapy is conducted in a naturalistic environment promoting interactive communication. The client's motivation and emotional involvement are the basis for the meaningful and powerful goals for motor speech improvement. Our therapy embraces use of the PROMPT System which is designed to address the physical/sensory, social/emotional and cognitive/linguistic needs of the client. A variety of programs are used such as the Developmental Individual Differences Relationship Based Approach (DIR), and the Son Rise Approach. Look for Links to these and other related websites. We collaborate with school and private speech language pathologists, physical therapists, occupational therapists, behaviorists and other professionals at the clinic, home or school to provide the most favorable outcome for your child or teen. The clinic has several rooms which serve a variety of purposes. Our sensory room has a suspension system with a platform swing, therapy balls, and a variety of equipment to help children learn and adapt in an optimal sensory state. Our Sonrise Room is adapted for use of the Sonrise Program from The Option Institute.